Hey, as long as we're talking about Herr's chips, allow me to present one of the most unique concepts for a potato chip ever: Kansas City Prime Steak Flavor. One look at these babies and I knew they'd be coming home with me - how could I possibly resist? Steak flavor chips? WHAT SORCERY IS THIS, HERR'S? They're probably one of the best onion-flavored chips the family has ever had, though we all agreed that they're a total failure when it comes to steak flavor. 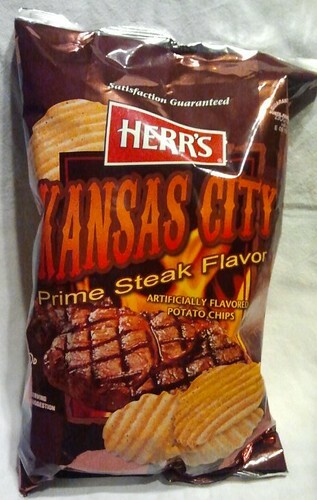 Nevertheless, Maryanne, Lynnafred and I decided that Herr's Kansas City Prime chips were one of our all-time favorites. YEAH! These rule. I always just assumed they dumped smoke flavor and seasoned salt in the mix for 'em, but the results are quite pleasing nonetheless. Have you had the "pizza" flavored ones yet? They're not bad... although I found the "cheddar horseradish" kind to pretty much taste like Windex, and the "loaded baked potato" variety is surprisingly gross, because the flavor coating is just too thick and powdery. The only place that sells Herr's regularly around here is a dingy little local K-Mart, and aside from pawing through their discount DVD rack once every other month or so, Herr's chips are the only other thing I buy there. 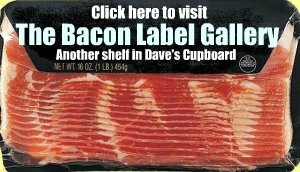 I think they are trying to make up for the absence of Snyder's of Hanover Grilled Steak & Onion potato chips, which I lived on in the summer of 1991, but now cannot find ANYWHERE. Try em if you can. They were good. Not as good as the Snyder's but you can't have everything. A Sack Of Frozen Pancakes?? ?